Yes, The Astrodome, 1974--"A Night of Firsts"
Growing up in Houston as a kid in 1960's, seeing the opening of the massive wonder of the world known as the Astrodome, it never entered my mind that one day I would see such amazing music performed in it. Until the early 1970's, if it wasn't sports, it wasn't in the Dome. When Yes came in 1974, I was a wee teen but already enamoured of the Yes sound. Having never been to a concert of any kind before, and a denzien of the piney woods far, far from Houston, I looked with fevered anticipation when my mother brought home the two tickets I had asked for. She bought them at Foley's department store. Nervously, I asked my crush (two years older than me) to come to the concert and she accepted--her first concert too, she said. Floor seats, residual hippies, and wafting strange aromas surrounded us as we literally sat on the floor of the Astrodome. Before the concert, I laid on my back and looked straight up to the central point of the domed roof. What a fine piece of architecture to experience our first "rock" concerts. After the opening acts (of little consequence to me, really), and a brief intermission, the lights dimmed and Firebird Suite (sweet!) exploded. 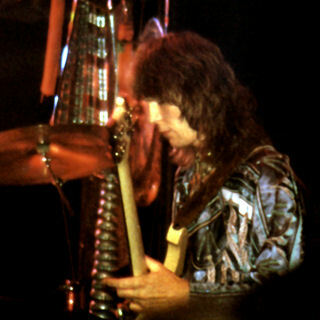 Then, Yes came out on stage and started what for many years to come would be the sequential memory of the oft played Yessongs album (I still have both it and the poster that accompanied the Roger Dean dustjacket). They played the songs I knew, and many that were new (Topographical Oceans I had not heard yet). On "You and I", my crush and held hands. All of the band members were strong and precise. Anderson's voice was nothing like a young guy from East Texas had ever heard before come out of a man, Howe was in his own world (as good as he knows he is), White was having a blast behind his kit, and Squire moved about the stage like a performer in a circus. Relayer was wild, The Fish was epic, The Clap fun, and Roundabout familiar. When it was all over, and we were thoroughly entralled (our first concert and all), crush and I walked out with arms around each other's waist, stopping short of the exit to--yes--kiss for the first time. I don't know where she is today--heck I don't know where I am today--but I know deep down she must remember this one cool December night of 1974 with fondness. We left Austin at 2 p.m. We took a coutnry route to Houston, through the infamous town of LaGrange as the afternoon grew later and my anxiety and incredulity grew stronger. We listened to Tales and talked minutae and sang as the countryside grew dingier and turned into the outskirts of Houston. We found the Astrodome pretty easily--how do you miss something as monstrous as the Astrodome?--and parked, all of us being in foul moods. It was five-thirty and we had to wait--it was cold and everything was an oceanic blue color. We walked around the Astrodome, heard the sound checks, clambered on chain link gates, and peered in through back ways at roadies throwing footballs. We waited and waited to find the duplicates for our lost tickets (my fault). It was cold, uncertain, anxious. Finally, through persistence, I got hold of them and we crawled under the fence, raced down the ramp whooping. Bottlenecks where they checked our tickets and through which we squirmed quite rudely. Our wrists were wrapped with yellow plastic and then we dashed madly for the open ground. We clambered over bodies and situated ourselves about 45 feet from the stage. We talked with our neighbors and the first band came on. They did some very nice almost Tullish music with recorders and oboes and all the usual paraphernalia. They were good enough, but the crude was rude and impatient. Next was Mahavishnu Orchestra, with many people on stage--almost a few superfluities, it seemed. (How to get your friends in for free. Make them part of the band.) But McLaughlin was good and so was the violinist Jean Luc Ponty. The Hymn for Him was the most beautiful piece, the violin and McLaughlin's guitar playing together then fragmenting into various themes and melodies. [Frustrated rock critic--KAT 10/04] They were good but the music did not have the complexities and beauty of Yes. We moved forward, encroaching and infringing upon the rights of others. We were squished and we tried to crouch down so that the people behind could see. Mellotron strains and the Firebird Suite and there was Moraz in his white suit, Squire in his tunic and boots (and smile), White generally invisible obscured by drums and people, How with his hair back and flashy choker. Anderson was so tiny, so beautiful with a tree embroidered on his left side with a few leaves drifting down the right. They sang an unknown song ("Sound Chaser") as the people in the first few rows fought and yelled "Sit down!" I felt so sad and so sorry for these rude people. we tugged shirt tails and knelt but it was bad through the first song and "Close to the Edge" ("I get up, I get down" most appropriate). Anderson tried to introduce a third song and a new one but the calling was too loud. "Sit down already," he said and "why don't the people in the middle move back." A new album ("hurrah!") and the new songs--"The Gates of Delirium." "You should like this," Anderson scowled because we were so demented. It was excellent, but unfamiliar and I don't remember it very well. 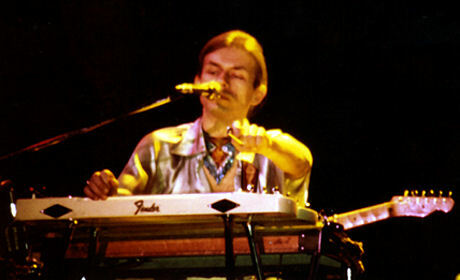 Then "And You and I," beauty of beauties, Howe and his anguished pedal steel, Squire and his harmonica. I was so high on Anderson's voice, on the wash of the music. They moved from there to a medley of the more musical moments from Tales, parts of the first and fourth sides--" We must have waited all our lives for this moment." We were on our feet, standing, obstructing, it was much too moving to sit through. How and Squire and Anderson played the tympanis and a metal bar--Squire had such a delighted expression, he had executed an exquisite bass solo and seemed very pleased. Anderson seemed a bit sad. The flowers! We threw them at the end of Nous Sommes due Soleil and we think Anderson saw them but didn't pick the up, alas. We arrived at the Astrodome around 5PM and milled around for almost two hours until the office opened and we got our duplicate tickets. But by then the crowd had been let loose and were racing for the stage. We thought it would be impossible for us to get good spots. But the ticket man was kind and let us crawl in under the back gate. We raced against the crowd, shoved frantically, and staked out a place in the fifteenth row. Gyphon came on. Then the amazing Mahavishnu Orchestra. Between Mahavishnu and Yes, Kathy and I wheedled up to the third row. Unfortunately many other people had the same idea and we were squished together as one standing mass. The people who were further back kept yelling for us to sit down, but we couldn't sit down if we wanted to see, since the stage blocked our view. Plus there was the danger of getting trampled. A near-riot ensued and Yes was through two songs (I get up I get down was apropos) before everyone calmed down. Jon Anderson did not look happy. Kathy and I felt very bad for him. Another great concert from Yes since I've seen very concert they have played in the city of Houston.The crowd was pumped up it was awesome.When the lights went down there must of 40,000 joints being fired up at the same time.What a sight!We were sitting about 20 yards from the massive stage at the Astrodome.When the concert was over nobody wanted to leave.After the show Chris Squire became a state hero.He has quite a following in the state of Texas especialy in the city of houston were he is known as one of the best bass players we have ever seen.Thanks again! My first concert, and my first date at the age of 15. My girl was from our church; all tinglely, we were. Sat in the Astrodome festival floor seating with eyes wide open. We were from a very small Texas town in the country outside Houston, and we had never smelled pot before and would only two years later realize what it was. Gryphon started--had a guy who danced around while playing an oboe! Mahavisnu was entertaining, if a bit pendantic. Firebird Suite introduced Yes as they exited a foggy Dean-designed Topographical tunnel. Patrick Moraz was mesmerizing in flowing white satin, arms stretching between two banks of keyboards--one in front of him, the other behind him. He really stood apart with his special talent. Squire seemed to be a magician with his bass, and the others put to life what I had only heard on my LP's. A special night all around, as my mom picked us up after the show and allowed us to both sit in the back of her Chrysler Fury III as she drove the hour and half back home. 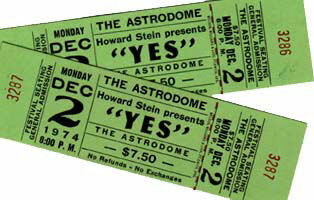 I saw Yes in the Astrodome. 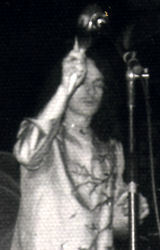 It was filled with Yes fans to a not quite sold out state. Festival seating on the field. The opening song was Soundchaser and they played all of Relayer. And Relayer hadnt been released yet, not for 2 weeks or so were we able to get it. No 'South Side' that night. But it was an excellent show.